Apple has removed HMV’s freshly launched iOS app from its App Store for breaching its terms by offering direct music download purchases and therefore bypassing its own iTunes store. While only released last week, having already passed through Apple’s approval process, Apple then realized that it had inadvertently let the functionality slip through its normally rigorous net and asked HMV to remove the download functionality before 18:00 BST yesterday. HMV failed to do so, and the company that now owns the brand – Hilco – confirmed that it had been temporarily removed from the App Store. However, it also noted that people that had already downloaded it should be able to continue using it without a problem. It’s now working around the clock to deliver a new version that will stay within Apple’s Terms and Conditions and said that, when released, it would include shortcuts to a user’s MyHMV locker which is used to manage downloads via HMV.com (relaunching on Thursday) and the m.hmvdigital.com portal. 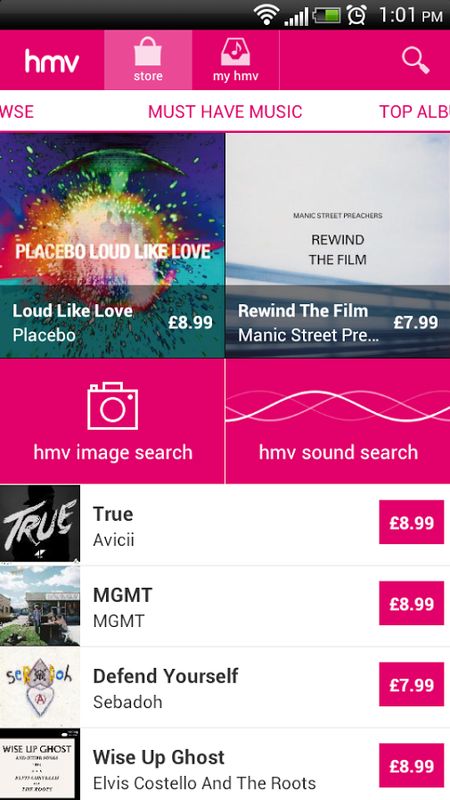 HMV’s Android app (shown right) is still available to download.